Read more about the rationale and process behind this change here. In this post, I’ll explain what the icons mean, and how they can someday become the basis for a set of new interactive music theory visualizations. Scales with more green in them sound “happier” or brighter. Scales with more blue sound “sadder” or darker. Scales with a mixture of blue and green (like harmonic minor) will have a more complex and ambiguous feeling. My ambition with the pitch wheels is not just to make the aQWERTYon’s scale menu more visually appealing. 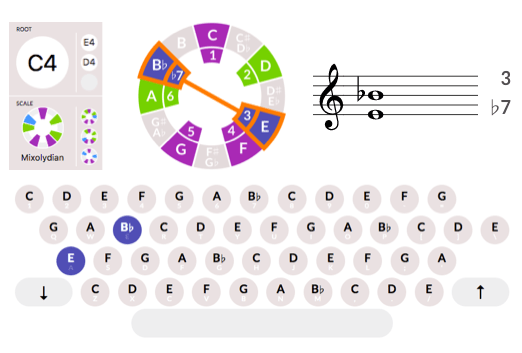 I’d eventually like to have it be an interactive way to visualize chords too. Followers of this blog will notice a strong similarity between the circular scale and the rhythm necklaces that inspired the Groove Pizza. 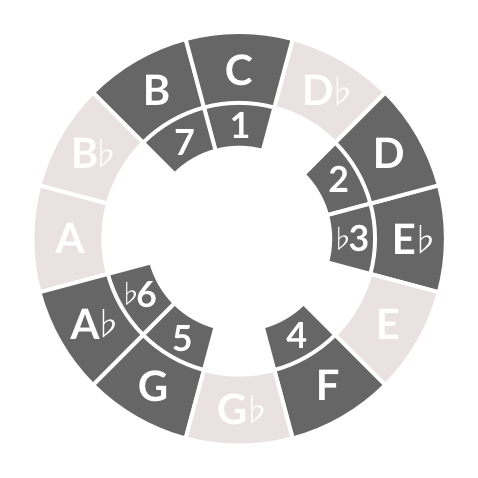 Just like symmetries and patterns on the rhythm necklace can tell you a lot about how beats work, so too can symmetries and patterns on the scale necklace can tell you how harmony works. So here’s my dream for the aQWERTYon’s future theory visualization interface. 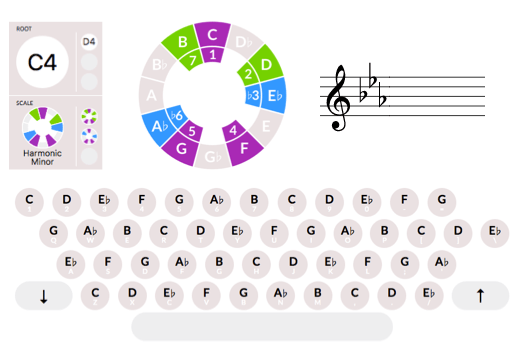 If you load the app and set it to C harmonic minor, here’s how it would look. To the right is a staff notation view with the appropriate key signature. 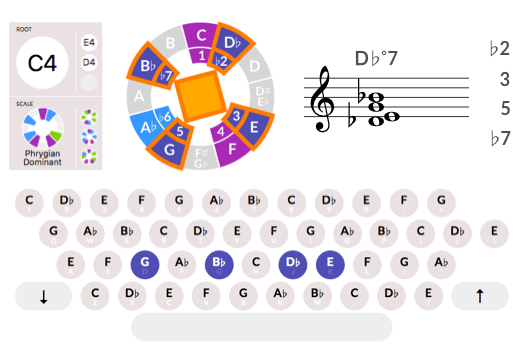 If you play three notes at a time, like the first, fourth and fifth notes in C Lydian, you’d get a triangle. 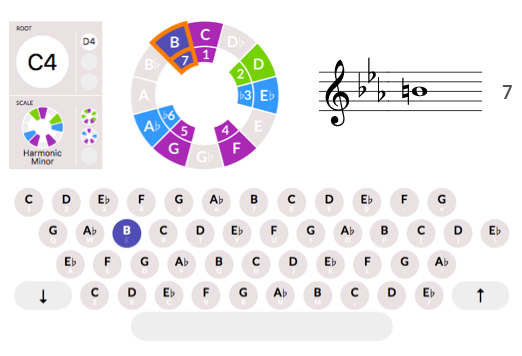 If your three notes spell out a chord, like the second, fourth and sixth notes in C Phrygian mode, the app would recognize it and shows the chord symbol on the staff. By rotating the outer ring of the pitch wheel, you could change the root of the scale, like I showed above with C harmonic minor. And if you rotated the inner ring, showing the scale degrees, you could get different modes of the scale. 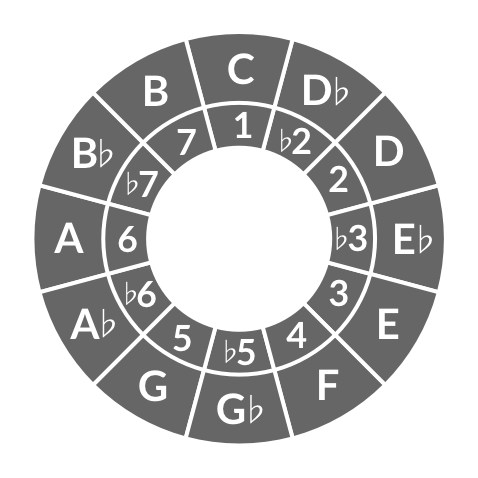 Modes are one of the most difficult concepts in music theory. That is, they’re difficult until you learn to imagine them as rotations of the scale necklace, at which point they become nothing harder than a memorization exercise. I’m designing this system to be used with the aQWERTYon, but there’s no reason it couldn’t take ordinary MIDI input as well. Wouldn’t it be nice to have this in a window in your DAW or notation program? Music theory is hard. There’s a whole Twitter account devoted to retweeting students’ complaints about it. Some of this difficulty is due to the intrinsic complexity of modern harmony. But a lot of it is due to terminology and notation. Our naming system for notes and chords is a set of historically contingent kludges. No rational person would design it this way from the ground up. Thanks to path dependency, we’re stuck with it, much like we’re stuck with English grammar and the QWERTY keyboard layout. Fortunately, technology gives us a lot of new ways to make all the arcana more accessible, by showing multiple representations simultaneously and by making those representations discoverable through playful tinkering. Do you find this idea exciting? Would you like it to be functioning software, and not just a bunch of flat images I laboriously made by hand? 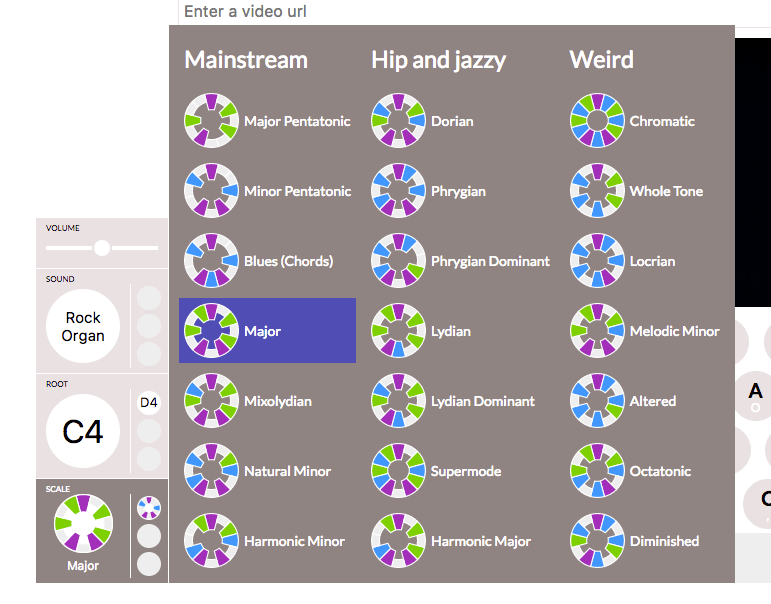 Help the MusEDLab find a partner to fund the developer and designer time. A grant or gift would work, and we’d also be open to exploring a commercial partnership. 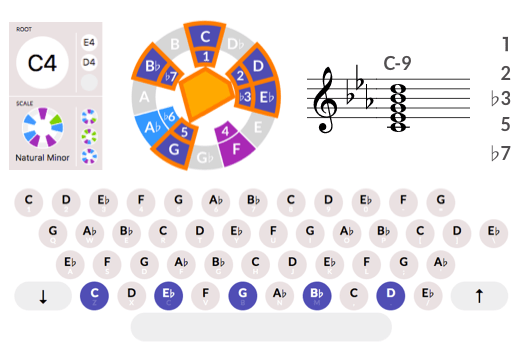 The aQW has been a labor of volunteer love for the lab so far, and it’s already one of the best music theory pedagogy tools on the internet. But development would go a lot faster if we could fund it properly. If you have ideas, please be in touch! Update: Will Kuhn’s response to this post.